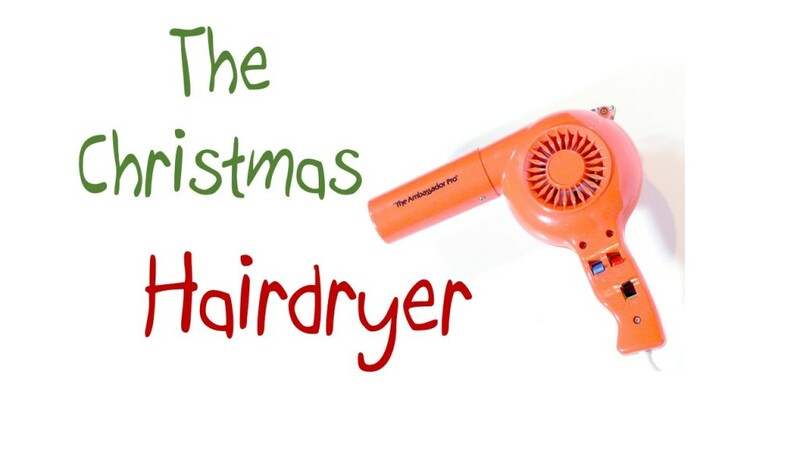 Every Christmas, as I gather with family, the story of the Christmas hairdryer emerges. You see, when I was little girl, my Dad, sister and I went to buy my Mom a Christmas gift. My Dad is such a great guy, but this particular year, he was a little behind on buying my Mom’s Christmas gift. It was Christmas Eve and off we went to the department store in town. Interestingly, my Mom rode with us. Once my Dad parked the car, my Mom stayed inside the car while my Dad, sister and I went into the store to pick out a gift that expressed our devout appreciation and love for her. I was four years old and my sister was nine. We did not know what a young wife and mother would want for Christmas so my Dad decided on a hairdryer. You know, something practical and useful! We purchased the hairdryer and I was beaming with excitement! I was so happy about this gift that I was about to bust! I thought a hairdryer was the most glorious gift ever decided upon and I could not wait to see the joy on my Mother’s face when she opened it on Christmas morning! I was so elated that in fact, I could not wait until Christmas morning! As my Dad carried the hairdryer in the plastic shopping bag to the car to put it in the trunk, I ran and jumped in the back seat. My Mom was still sitting patiently in the front seat of the car. Around Christmastime, this story resurfaces in our family. We enjoy a good laugh about that Christmas Eve, but do you know what really makes me smile? The fact that I still remember the joy I felt in my heart over the Christmas hairdryer. It did not matter to me that it was a hairdryer. What mattered to me was that we had a special gift for my Mom. I loved her so much and I could not wait to give it to her! When I think a little more deeply about the gift of the Christmas hairdryer, God nudges my heart about the most special gift He gave over 2,000 years ago in His son, Jesus. My heart is convicted because sometimes the weight of the world feels like it is on my shoulders and I lose my perspective about what really matters in this life. I wonder if you ever feel that way? Do you sometimes feel the weight of the world on your shoulders? Do you sometimes worry about your life and forget that God is in control? Do you ever find that you have lost your excitement about your faith? It’s normal to feel that way from time to time. The important thing is that you do not settle for being in a spiritual slump. The important thing is that you find the courage to confess your sins, repent and get back on track with God! As we begin 2016, let’s be diligent to spend more time in prayer, more time reading our Bibles and more time serving others. It won’t happen just because we want it to happen. Like all relationships, our relationship with God takes work! We can have great intentions but not make any progress because we do not implement a plan. We need to implement spiritual disciplines into our lives that grow us closer to God. We need to seek after Him with all of our heart! Go to bed 30 minutes early or get up 30 minutes earlier than normal so you can study your Bible and pray. Pick a Bible reading plan and stick with it. You don’t have to read the Bible cover to cover in just one year (although that is a great goal to have). Pick a plan that works well for you. Download a Bible podcast or Bible App (like the daily audio bible https://dailyaudiobible.com). Set a time and listen everyday. Start praying with your family or change up your family prayer time to go deeper into God’s Word. Start a “joy jar”. A joy jar is an empty jar you can decorate and place in a prominent place in your home. On a regular basis, have your family write down moments of “joy” where God has answered prayers throughout the year. Memorize scripture. You can use simple 3 x 5 note cards. Write down one verse a week and start memorizing. I have found that posting the verse in my car is a great way for me to memorize scripture. Read and study the verse over and over throughout the week. You’ll be amazed at all the scripture you can memorize in a year. Join a Bible study at your church or at a friend’s church. Plugging in at your local church is so important for your spiritual growth. Get your mind off of your problems and invest in others. Get busy serving! When you feel discouraged, stop and count your blessings! As a little girl, I was thrilled about the Christmas hairdryer gift, but you know what? As followers of Christ, you and I know the GREATEST gift of all, Jesus! Sometimes we don’t feel as excited to share Jesus as we once did. This often happens because we get too caught up in the cares of this world. We lose our perspective and drift away from God. The good news is that we serve a gracious God and we can come back to Him! Do you want a closer relationship with God? You can have it! You need the right perspective, a plan, and perseverance! Be determined to make 2016 a year of dramatic spiritual growth! Sweet story! I think a lot of men wait and shop Christmas Eve. I like your tips. I’m going to try a few this year. Thanx for your encouragement Joy. Great reminder Joy! I needed this tonight! this really made me smile! what a sweet childhood memory. thank you for always being encouraging. i love reading your blog. you need to post more oftnn.